If you don’t know his name, you know his photograph—Che staring into the distance like a prophet—that has been reproduced on millions of T-shirts and posters around the world. Korda always said he didn’t mind its use on the ubiquitous revolutionary paraphernalia but finally drew the line in the 1990s when Smirnoff used it for a vodka commercial, which he considered “disrespectful”. Alberto Korda was born Alberto Díaz Gutiérrez in Havana, 1928—the same year as Ernesto Che Guevara. Their fates were to be entwined as Korda’s portrait of the Argentine became his most famous photograph. 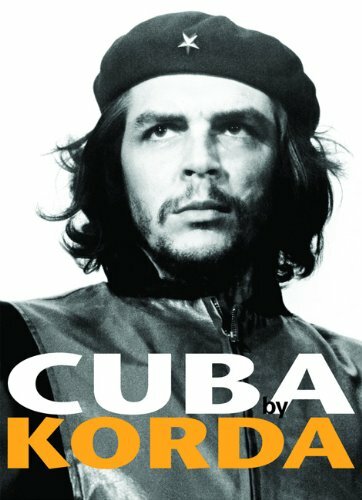 Korda was Cuba’s best known photographer of the revolutionary period. He died in Paris in 2001. This book, originally published in France, gives an overview of Korda’s extraordinary camerawork, from his first work as a fashion photographer to “The Quixote of the Lamp Post” – a Cuban peasant sitting on a lamp post above a sea of people during a mass rally. It includes other somewhat quirky and less well-known photographs, such as Castro warily eyeing a tiger at the Bronx zoo and Che Guevara playing golf. The proof strip of the roll of film from which the famous shot of Che was taken is also reproduced, including Korda’s photos of Jean Paul Sartre and Simone de Beauvoir who were visiting Cuba which were published at the time, not the photo of Che! Korda liked the photo and stuck it on his wall until an Italian journalist spotted it and took it home.